Whether you train in MMA, Muay Thai or boxing, a mouthguard is one of the most vital pieces of safety equipment that you can own. As such, it’s incredibly important that you purchase a high quality mouthguard that will offer you a substantial amount of protection. That being said, deciding what mouthguard to use can be a tricky task. 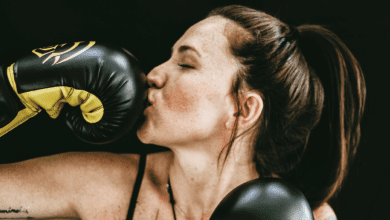 Luckily, we’ve compiled this list of the best MMA mouthguards' currently available, breaking each one down and providing you with all the information you need to know. 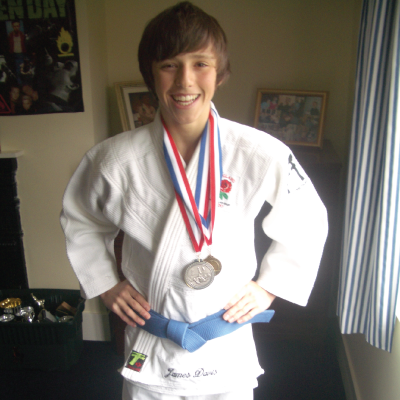 Mouthguards' are a great way to help ensure your safety whilst participating in martial arts, they dissipate trauma taken to the head and help to prevent loosing or chipping a tooth (something that is both painful and expensive). 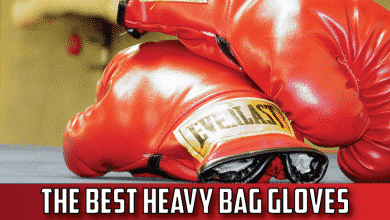 Even if you’re partaking in a light sparring session with padded gloves, it’s always best to ‘play it safe’. It’s surprisingly easy to chip or lose a tooth and annoyingly harder to get it fixed. All it takes is for one well-placed strike to a loose jaw and it’s a trip to the dentist for you. Chipping a tooth is something that you will have to get fixed, as leaving a damaged tooth can lead to further problems and pains. What Should I Look For In A Mouthguard? How Do Mouthguards Prevent an Injury? How Do I Use A Mouthguard? When it comes to looking at the best MMA mouthguards', you’ll come across two different options; custom fit and boil & bite mouthguards. Boil and bite mouthguards require you to heat up the plastic guard and mould it to your teeth yourself. Where as a custom fit guard requires you to create a mould of your teeth and send it to the manufacturer to create your specialised guard. This of course is more expensive and more effort, however the results are far better than that of a boil and bite guard. When ordering a custom mouthguard, you usually get sent a mould kit from the manufacturer; you then make the mould and send it back. The kit comes with everything required to make a mould, as well as a detailed set of instructions. The process is pretty simple and only takes 10 minutes, so it’s really not that bad. Alternatively, you can get a mould made at the dentist and send this to the manufacturer. Some dentists may even be able to supply you with their own mouthguard, so it’s worth looking into. Although it may seem like a lot more effort, it’s actually can be a lot easier than opting for a boil and bite guard. This is due to the fact that the boil and bite method is pretty easy to mess up and often means that you have to buy a second guard. I’ll go into more detail on this further in the article. Custom fit mouthguards' are well worth the extra time and money as they provide the best possible fit and protection for your mouth. You will find that custom-made mouthguards stay in place incredibly well and you can even have a full conversation without it getting out of place. The unfortunate reality of martial arts is that you’re face is going to take a beating. Whether from striking or grappling, you can expect to take a few blows to the head. What would you rather have protecting you? A high quality mouthguard, custom made to protect your teeth specifically? Or, a cheap mouthguard that isn’t the best quality and could easily come loose? Made exactly to the shape of your teeth for the perfect fit. They won’t come lose whilst your training or competing, which can be a major distraction. A lot easier to breath than with boil & bite mouthguards. Takes longer to get your mouthguard, as you have to make the mould, send it back, wait for it to be made and then wait to receive it again. Important Note: It’s worth mentioning that if you have a permanent retainer (like me), it’s highly recommended that you buy a custom fitting mouthguard. If you use a boil and bite mouthguard you could easily mess up the mould, which can actually damage or break the retainer. This will undoubtedly cost you a good amount of money and a lot of effort. 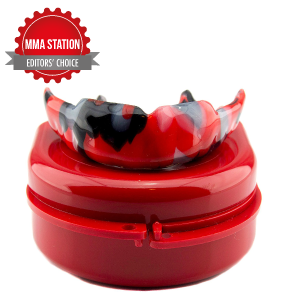 Before getting to our list of the best MMA mouthguards, I wanted to first talk about our editors choice, the Impact Professional mouthguard, one of the best MMA mouthguards you can buy. If you’re looking for a high quality, long lasting and seriously protective mouthguard, then I think you’ve found it. Impact are a professional standard manufacturer of mouthguards and offer easy to set up guards designed specifically for MMA, boxing and Muay Thai. Once you order your mouthguard, you will receive an easy to use impression kit that also includes paid return postage. This is great as it saves you a trip to the dentist and is also incredibly easy to do. The high impact mouthguard has a 6-7mm thickness that allows it to fully absorb the power from the blows to your face. Because the mouthguard is specifically moulded to your teeth, the thickness should not affect your ability to breath. The mouthguard itself is manufactured from a high quality, BPA free material that is both long lasting and high impact absorbent. With a range of designs and colours, the Impact gum shield is one of the best MMA mouthguards around. Boil and bite mouthguards are by far the most common mouthguards used for MMA, boxing and Muay Thai. This is because they are significantly more affordable than custom fit guards, and when done correctly, still offer good protection for you mouth. To mould your boil and bite mouthguard you first have to warm it up, which causes the material to loosen and become impressionable. You then bite down on the guard, creating a custom mould of your teeth. Once you’ve done that, you cool it down and voilà… you’ve got a mouthguard. Creating the mould of your teeth and be tricky and is where a lot of people mess up. Luckily most manufacturers provide detailed instructions that you can follow. These are definitely the best mouthguards for MMA if you’re on a budget, but still want a good amount of protection. Unfortunately, boil and bite mouthguards tend to come out of place a lot more often than with custom fit guards. This is because the moulding process isn’t as thorough and is a lot easier to go wrong. This isn’t a deal breaker by any means, just something that you should be aware of. You can watch the video below by Corydon Coach for a full guide on how to mould your boil and bite mouthguard. Price VS Quality: When investing in a product that is designed to keep you safe, it’s always worth going for the highest quality possible. Often this means a higher price tag, but when it comes to safety, what’s a few extra bucks? Plus, you will more than likely regret not getting a custom fit mouthguard if you break a tooth and have to pay the dentist bill. In the long run, a custom fit mouthguard could well be cheaper. Size & Fit: Always try on your mouthguard before you start using. Wearing an ill-fitting mouthguard whilst your sparring or training could actually do more harm than good. For reference, when you open your mouth with your gum shield in, it should hold its place around your teeth without falling down. If you buy a boil and bite mouthguard, make sure you take the time to ensure you mould it correctly. This process will make or break the quality of your mouthguard, so make sure you do it right. Protection: Of course, the whole point of getting a mouthguard is for protection. The best MMA mouthguards tend to be thicker than regular mouthguards in order to absorb the high impact blows than can be expected. In order to provide your mouth with more protection, the thick design of the gum shield can sometimes affect your ability to breath. Mouthguards and be placed in two different categories, light impact and heavy impact. When looking for the best mouthguard for MMA, make sure you go for a heavy impact design, as these are thicker and able to dissipate higher impact blows. Using a light impact mouthguard will be far less effective and can still result in damage to your jaw, teeth and face as they are unable to absorb as much damage. Design: Although we rarely see a gum shield when it’s in, they come in an array of designs. This shouldn’t be a deciding factor as you should always priorities functionality over design, but it’s always nice to have a cool looking mouthguard. 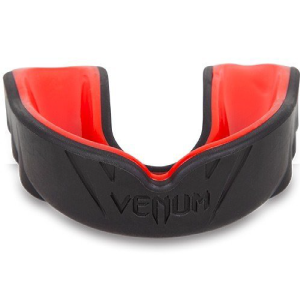 First up on our list of the best MMA mouthguards is the Venum Predator. If you’ve not read one of our articles before, we’re massive fans of Venum. They make some great quality gear for pretty damn affordable prices. The Predator Mouthguard is no exception and is by far one of the best boil and bite mouthguards for MMA. In fact, the Venum Predator comes highly recommended by professional MMA fighters, like the UFC’s middleweight, Lyoto Machida. 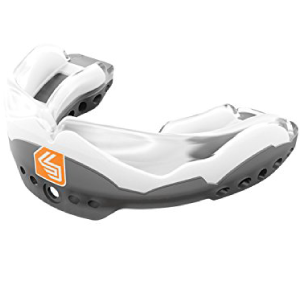 The mouthguard makes use of a high-density rubber frame and a multi layered design that absorbs the shock of high-powered blows to the face and offers you a serious amount of protection. The Predator mouthguard’s low profile design allows the wearer to breath freely, especially in high intensity situations. The shape of the mouthguard is designed to align perfectly with your jaw, allowing you to tense up before getting struck. 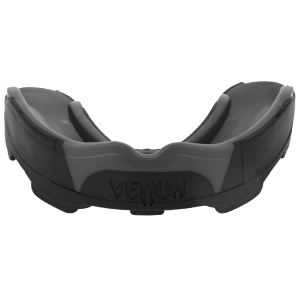 As well as this, the Venum Predator is one of the easiest boil and bite mouthguards to set up and comes alongside a free Venum protective case. You also have the option of 15 different colour styles, so you’re bound to find on you like. Think of the Venum Challenger is the little brother to the Predator we just discussed, its thinner, lighter and cheaper. The Challenger makes use of the same Nextfit Gel Frame and high-density rubber frame that allows the shock of high-powered blows to be absorbed. Although sporting a relatively thick design, the Challenger still allows the wearer to breather freely and holds its place extremely well. The Challenger is equally as easy to set up as the Predator and again comes alongside a set of detailed instructions. You can have your mouthguard moulded and ready to go in less than 5 minutes! However, I would spend more time on it than that, just to make sure you do it right. Now this is one awesome looking mouthguard! Remember how I said not to priorities design over functionality? 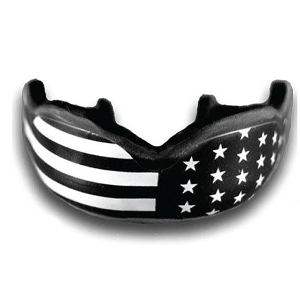 Well with the Battle Flag MMA Mouthguard, you can have both. Although it costs less than $30, it is still one of the more expensive items on our list of the best MMA mouthguards. The battle flag mouthguard is manufactured using high quality material that is 150% more shock absorbent that the industry standard material. What’s great about this mouthguard in particular is that it can be worn with braces. This was always something I had a problem with when I was younger and is the main reason I started using custom fitted mouthguards. It would have been good to have this back in the day. Alongside the mouthguard you also get a ventilated carry case, which is a nice little addition as not all mouthguards come with a case. Up next we’ve got the Shock Doctor Gel Max mouthguard, an extremely popular choice due to its affordable price tag. This is actually a multi-purpose mouthguard, however many MMA fans have taken to it due to the high level of protection that it provides as well as being extremely affordable. The mouthguard makes use of a triple-layered design consisting of a heavy-duty rubber exoskeleton, an intermediate layer and a Gel-Fit liner that moulds to the wearers teeth. 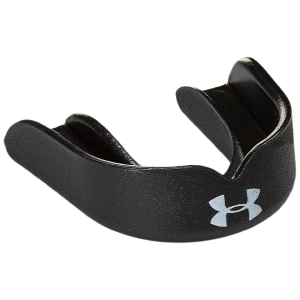 The UA ArmourFit mouthguard is a great all round mouthguard designed for all contact sports. The latest Armour Fit technology allows the mouthguard to fit extremely well to the wearers’ teeth, providing that the moulding process is done correctly. As well as this the mouthguard is designed to be chew-resistant and thanks to its low profile design allows the wearer to talk and breathe freely. Being priced at less than $15, this is one of the best value for money mouthguards on the market. Especially with a reliable brand like Under Armour, you know it’s going to be good quality. 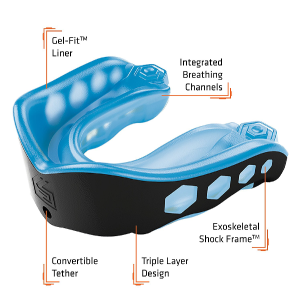 Moving onto the last model on our list of the best MMA mouthguards, the Shock Doctor Ultra 2 STC. The Ultra 2 Shock Transfer Core has been specifically designed to deliver a deep, form-fitting bite that allows the shock of blows to be easily dissipated. What’s more, the aero-cushioned, anti-shock pads provide cushioning for your teeth and reduce the impact on your jaw from a blow. This is one of the best MMA mouthguards for training as it will allow you to communicate with your partner more clearly, without having to keep taking your mouthguard out. Before we look at how a mouthguard prevents injuries, perhaps we should first discuss the different ways that injuries can be sustained from receiving a blow to the head. Firstly, the impact from the blow will disperse a shock wave through your jaw and skull. If powerful enough, this can cause you to sustain a concussion or even break your jaw. Often, when on the receiving end of an uppercut, the blow will cause the bottom of your jaw to smash upwards, causing your teeth to hit together. This impact can then shatter, chip or completely dislodge a tooth from your gum. Of course, if you receive a blow with enough power directly to the mouth, you can easily loose a tooth or two. If you need a reminder as to why you should wear a mouthguard, just have a think back to the Rousey VS Holm fight at UFC 193. After receiving a pretty brutal leg kick, Rousey’s mouth and jaw were in tatters. Luckily she didn’t actually break her jaw, which could well have been thanks to her mouthguard. Still though, it was said she couldn’t eat an apple for 6 months… ouch. So, how does a mouthguard work to prevent all this from happening? Cushions teeth against impact: By wearing a thick, protective mouthguard you help to mitigate the full force of the blow taken to your mouth. The rubber wall of the gum shield is designed to be impact absorbent and to reduce the shock felt by your teeth. This also prevents your teeth from slamming together in the event that you receive a nasty uppercut. Protects your jaw from joint injuries: Mouthguards are designed to protect your jaw my absorbing some the impact that your face receives when getting struck. Mouthguards allow you to tense your jaw tight, which again helps to disperse the impact across your face. Helps prevent soft tissue injuries: A mouthguard helps to absorb most of the shock from a blow that would usually be directly felt on your faces soft tissue. It also helps to spread the impact more evenly across your face, preventing one area from sustaining more damage than any other. Whilst training, try and get in the habit of tensing your jaw before being struck, as the most brain rattling blows are always down to having a loose jaw. Tensing your jaw will help to disperse the force evenly across your face, and fully prepare your body for the impact. Wearing a mouthguard will protect your gums and teeth, however if you do not tense your jaw, it will do little to decrease the impact to your face. If you’ve ever been caught with your jaw loose, you’re probably well is of the difference it makes. As you can probably tell from our list, Venum are pro’s at making the best MMA mouthguards. 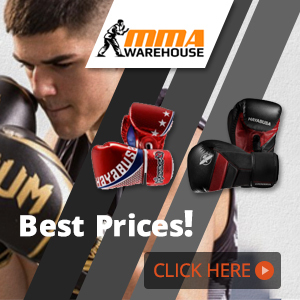 As I mentioned earlier, they’re one of the market leaders in providing a whole range of high quality fight gear. Although their mouthguards tend to be boil and bite, they’re still extremely high quality and you’ll struggle to find a mouthguard at the same price range that can match it. Shock Doctor produce an array of equipment for a tonne of different contact sports. They’re veterans in the market and over the years have refined their process to create some of the best MMA mouthguards available. Due to the fact that Shock Doctor produces mouthguards for so many different sports, it’s important that you buy a high impact model suitable for MMA. Depending on if you follow the boil and bite process correctly, the Shock Doctors are some of the best mouthguards for MMA that you can buy. I just want to finish by stressing the important of wearing a mouth shield. As I mentioned earlier if you’re in doubt, just wear one. Considering some of the models on our list cost less than $15, it’s a worthwhile investment that can save you money and pain in the long run. Have a good think about if you want to spend the extra money and get a custom fit mouthguard. I would highly recommend doing so, but if not be sure to get a high quality boil and bite guard and follow the moulding process precisely. Thanks for taking the time to read our article on the best MMA mouthguards. I hope that you’ve found it helpful and if you have any questions please feel free to comment below.